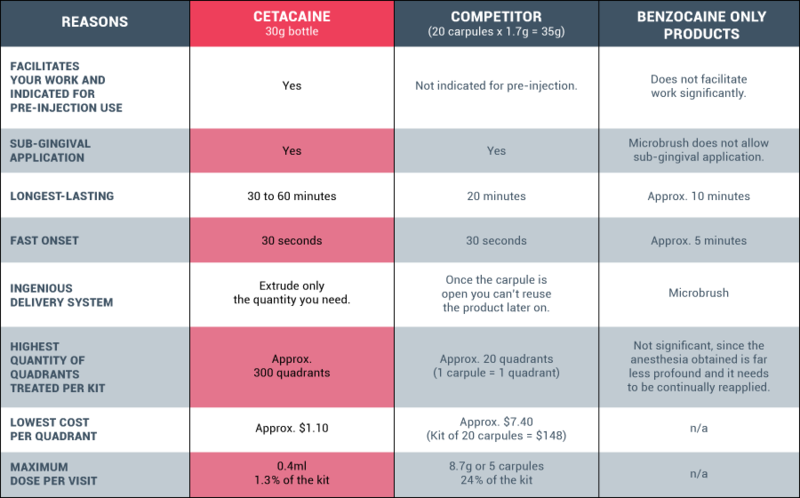 The combination of benzocaine (short duration for a quick onset in 30 seconds), tetracaine hydrochloride (slow onset for an extended duration of 30 to 60 minutes) and butamben (intermediate action bridge) acts by reversibly blocking nerve conduction. The speed and duration of action are determined by the ability of these agents to be absorbed by the mucous membrane and nerve sheath and then diffuse out, and ultimately be metabolized, primarily by plasma cholinesterases, to inert metabolites which are excreted in the urine. 1. Remove the shipping cap, discard and replace with luer-lock dispensing cap. 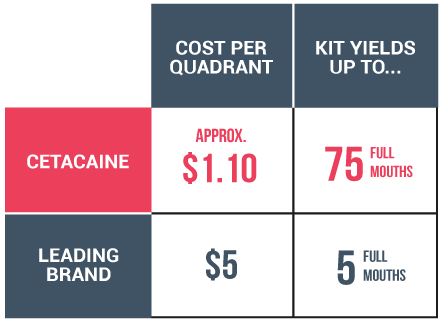 Once dispensing cap is in place, it should not be removed. 2. Remove the small cap from the luer-lock port. Retain for replacement after use. 3. Lock a delivery syringe onto the port. 4. Invert the bottle and slowly draw liquid (0.4ml maximum) into syringe. If air is drawn into syringe, push the liquid back into the bottle and slowly re-draw liquid into syringe. 5. Holding bottle upright, remove the syringe from the port and replace the small port cap. 6. Attach a microcapillary delivery tip to the syringe. The tip may be bent to improve access. 7. 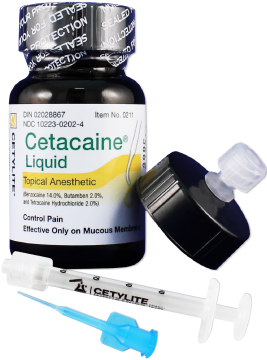 Apply Cetacaine Liquid drop-wise to accessible mucous membrane (such as the buccal and lingual sulcus) by slowly depressing the syringe plunger. 8. Wait 60 sec. 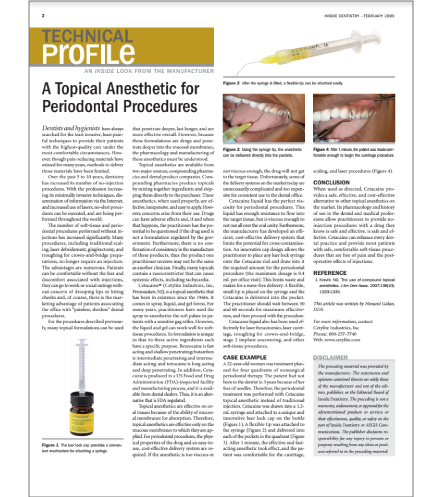 for maximum anesthesia before beginning procedure. 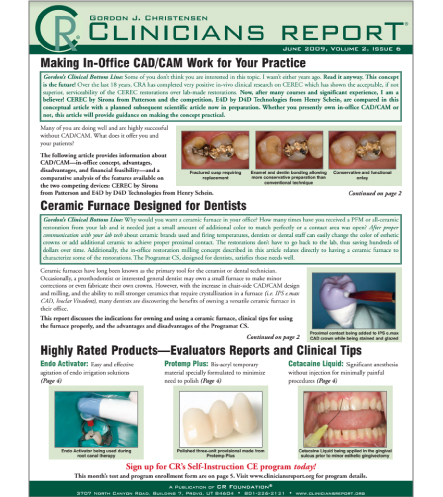 • For optimal use, apply Cetacaine on 2 to 3 teeth at a time. 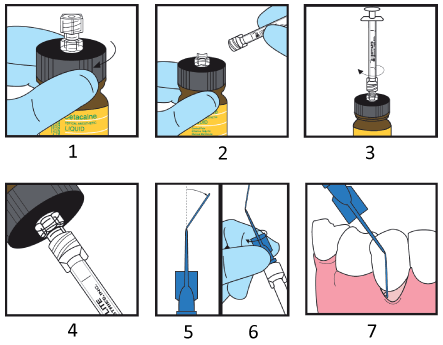 If necessary, reapply until pain is controlled without exceeding 0.4ml. • Using a microbrush is indicated when periodontal pocketing is not deep but the tissues are inflamed and sensitive. Place a few drops of Cetecaine in a Dappen dish and apply with a microbrush by running it along the sulcus. Should never be used for injection. Should not be administered to patients who are hypersensitive to any of its ingredients or known to have cholinesterase deficiencies. Should not be used under dentures or cotton rolls, as retention of the active ingredients could possibly cause an escharotic effect. The complete product monograph is available by contacting us at 1-888-442-7070 or here.